Directly across from St. Paul’s Episcopal Church is the Burt house, more commonly known as the Adams Home. The Burt family is one of the most significant in Upper Michigan history beginning with William Austin Burt who discovered iron ore in Marquette County, thus leading to the building of the mines and Marquette as a harbor town. This home was built by William Austin Burt’s grandson, Hiram Burt. Hiram and his wife fell in love with a house in France while traveling there in the 1870s, and they decided to build a replica in Marquette. Hiram owned the Burt Freestone Quarry and used its own brownstone to build his home. 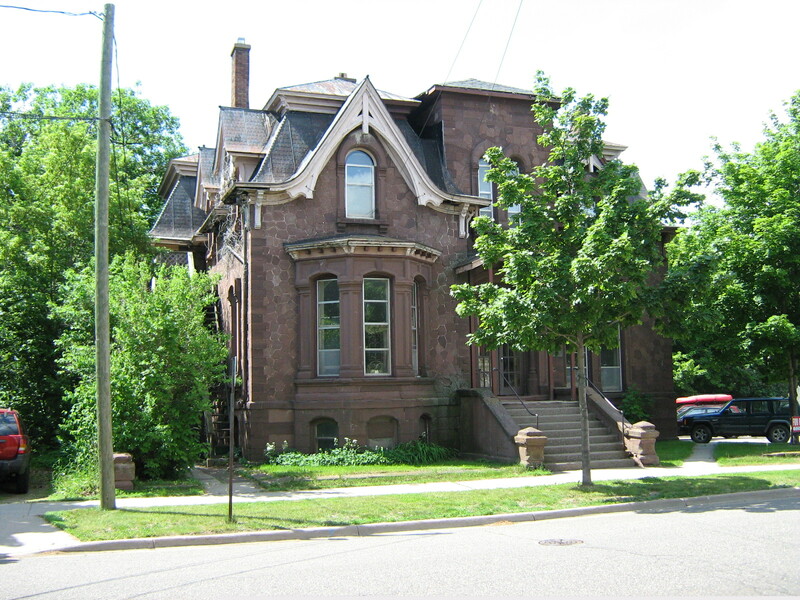 It included a Mansard roof with Gothic gables, and a gabled tower. Behind the house, on the sloping hill down to the lake, numerous terraces were built for gardens and a place to hold parties. Hiram Burt decided to sell the house to Sidney Adams, and then he moved to 351 E. Ridge Street. The Adams home today. The upper floor has been removed and it is currently the Terrace Apartments. Sidney Adams, the house’s second owner, arrived in Marquette in 1850 with only a dollar to his name, but he bought an ax for fifty cents and set out to become a woodsman. He soon could afford to buy a wagon and oxen to deliver wood to his customers. Besides starting a side business as a potato farmer, he received a contract to haul iron ore in his wagons from the mines to Marquette in the years before the first railroad arrived. He also went on to own a sawmill and to invest significantly in land. When he bought the Burt house, Adams indulged in designing terraces on the hill behind the house and filling them with fruit and vegetables, as well as bridges for people to walk on. He extended the terraces not only behind his property but behind many more houses extending eastward along Ridge Street. Adams also reputedly built an underground tunnel that ran from his house across the street to the Episcopal Church so his invalid adopted son, William Sidney Adams, could attend church without going outside. Will Adams, the adopted son, was born in 1878 to Detroit parents who died while he was an infant. In his youth, Will was a soloist in the boys choir at school and church and enjoyed athletic pursuits, but a baseball injury resulted in soft tissue becoming hard until eventually he ossified into a living statue. By his mid-teens he was confined to a portable couch and only his face remained mobile. By sheer willpower, Will survived to the age of thirty-two. No longer able to perform athletics, he became one of Marquette’s first literary figures, starting his own magazine business. His family hired him an attendant to whom he could dictate his magazine. He named his magazine CHIPS. Besides his own text, he included political cartoons and even caricatures of such town leaders as Peter White, Nathan Kaufman, and John M. Longyear. The paper was largely supported by advertising, so a phone was installed in the Adams home, and his attendant would hold the phone to Will’s mouth so he could talk up his bi-monthly magazine to prospective advertisers. After her parents and adopted brother’s death, Bertha Adams remained in the house for many years, but as time went on, her father’s terraces fell into disrepair and the gardens became overgrown. When the house was sold in 1946, only slight vestiges of the gardens and terraces remained. After the house was sold, the gabled tower was removed, and the house broken up into the aptly named Terrace Apartments, which it remains today. You are currently browsing the MY MARQUETTE weblog archives for April 2013.